Presented by the Sacramento Blues Society/Blues in the Schools program and produced by Swell Productions, this inaugural music festival will present some of the greats in the blues and roots music genres. "Blues In The Schools is all about opening ears, opening eyes and opening hearts” says Liz Walker, BITS chair person. “Giving students an opportunity to find their own innate talents builds a capacity for self determination and individual expression, which then grows into community building. We are expecting 800-1000 happy attendees experiencing something out of their box. The ticket price is extremely family friendly - only $10!" Also on site will be representatives from state & community services, such as: public safety, apprenticeship programs, volunteer opportunities & anti-bullying/suicide prevention resources. Attendees will be encouraged to participate in all the experiences available to win prizes by having their “passports” stamped at each installation. Amazing low price. Bring the family! Tix: $10 per person Gates @ Noon. Ends at 10 p.m. All ages. Plenty of onsite $5 parking. Bring low-back chairs. No outside food or drink. 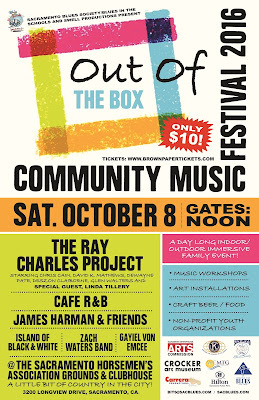 No Comment to " Sacramento Blues Society/Blues in the Schools Announces 'Out of the Box' Community Music Festival "